Beauty Care Choices: Dry or Dehydrated? 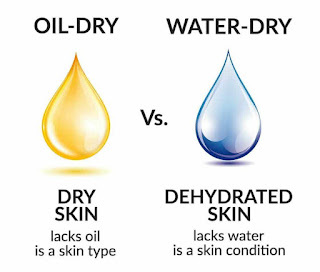 Is your skin naturally on the dry side or is it dehydrated? Determining which is important in providing your skin with the product(s) needed. At first glance, ‘dry’ and ‘dehydrated’ seem like two words to describe the same thing. But when it comes to skincare, they are completely different concerns with different underlying causes. "Dry" is a skin type related to oil production. If your skin is genetically predisposed to produce less than adequate oils, then you are likely going to have chronically dry skin. As we age, our natural hydrating oils (sebum) levels drop. If this is your problem it can worsen when you use a powdery make-up or harsh skin cleansing products that strip away the little oils you have. Excess exfoliation can also contribute to your dry skin problems. Because dry skin doesn’t produce enough moisturizing oils, it’s important to find highly-emollient products to fortify your skin’s oil reserves and plump up the volume on your natural moisture barrier. Look for heavier creams with an oil base like Jojoba, Coconut or Sesame or even Shea Butter for rich hydration. Humectants like lipids, ceramides and Hyaluronic Acid are also great to bolster the protective shield on skin and seal in the moisture. 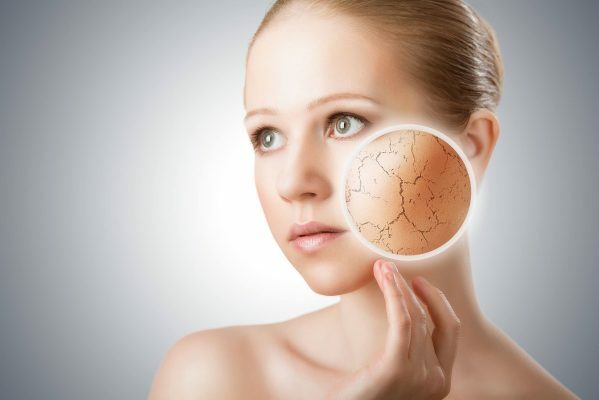 Dehydrated" is a skin condition related to the water content of skin cells. It is associated with a crepiness or small lines that form when skin is manipulated. Common causes are mostly lifestyle based, including smoking, certain medications, a diet high in salt or caffeine as well as seasonal changes and environmental factors such as heating and cooling systems. It is also a good indication you are not drinking enough water each day. What can you do? There are some options that can make a difference and help you reduce those small lines and wrinkles. An oil infusion can be very effective. First wash your face thoroughly with a gentle cleanser and exfoliator. Next smooth on the skin oil. We can recommend Amir 100% Pure Rosehip Oil or Amir 100% Pure Argan Oil. Leaving the oil on the face, apply steam for 10 minutes. (If you have a facial steamer, great!. If not, boil water, remove from the stove and put inside a "tent" you make with a towel. Be very careful not to burn yourself.). Skin is the largest organ in our bodies, so it is very important to use top-quality ingredient to keep your skin hydrated. Apply moisturizers or serums that contain fragmented hyaluronic acid, which is especially good for keeping water in the skin. For dehydrated skin, the focus is less on oils and more on restoring hydration, preferably with water-based lotions. Humectants are also good for dehydrated skin because they attract moisture from the atmosphere without breakout-causing oil. Look for non-comedogenic lotions with Glycerin, Hyaluronic Acid or Alpha Hydroxy Acids (AHAs). AHAs are great because they not only lock in moisture, but they also slough away skin-dulling debris that can clog pores. Niacinamide, a potent form of vitamin B-3 that is a multifunctional approach to both dryness and dehydration by boosting ceramides and fatty acids. Acetyl hexapeptide-37 is a powerful skin tool. It's a protein found naturally in the skin and it regulates the way hydration moves between the basal layers of the skin. A final thought. All of the above help, but only when used consistently. There is no miracle or instant cure for dry or dehydrated skin, but you can keep it looking its best by being consistent in your skin care regimen.